How to Sow a New Cool-Season Lawn | Gardens Alive! Q. Mike: Most of our grass died last summer. We thought it might come back; no such luck for the most part, so we will plant a new lawn. When do we start killing the existing grass with Roundup or a similar product? And when should we re-seed - after Labor Day? Thanks. A. How about NEVER for the Roundup, Val? Is never good for you? I strongly believe that no one should ever use toxic chemical herbicides like Roundup anywhere; but your region, with its proximity to the Chesapeake Bay and other vulnerable bodies of water, would be an especially poor place to use a chemical strongly linked by University research to the death of frogs, toads and other amphibians. (You'll find many interesting discussions of the dangers of Roundup—with citations—throughout this Wikipedia entry. And why would you expect a new lawn to thrive in soil that was just sprayed with a chemical designed to kill grass? Sheesh. Besides, this chemical approach is most often used when the homeowner or landscaper wants to try and dodge the big issue—the crappy, compacted lifeless soil they hope the new lawn will somehow grow in. One of the biggest mistakes Americans make is trying to grow grass in the equivalent of concrete; it's like trying to paint a room with greasy walls. 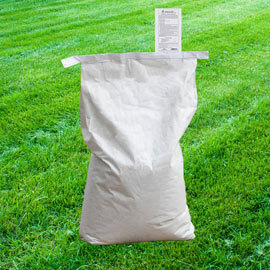 Fail to prepare the soil for planting and your lawn will never prosper. Spend the time and energy to do this right and your turf will practically take care of itself in the future. And forget gimmicks; no technique like 'slit seeding', 'hydro seeding' or other nonsense can overcome the problem of lousy soil; it'll just raise the cost of your ugly new lawn. Now, tilling does cause weeds to emerge from hibernation. In his excellent book on lawn care, our resident turf grass expert Dr. Nick Christians of Iowa State University recommends the 'stale seed bed' technique I often advocate to get around this problem. After tilling up and raking the soil, level it out, water it well and wait a week to ten days for the weed seeds that were uncovered and then replanted by your tilling to germinate. Then toast them to death with a flame weeder at the height of a hot and sunny day or slice them off at the soil line with a SHARP hoe, taking care not to disturb the soil again. This will eliminate the vast majority of weeds that would have attempted to compete with your new lawn. You can either move to the next step at this point, or water the soil a second time, wait ten days and repeat your preferred technique of gentle killing to make sure you start off right. Then have a big load of yard-waste compost delivered (or a 50/50 mix of compost and high-quality screened black topsoil) and spread it at least an inch deep on top of your prepared old soil. Level the soil again; a level surface is essential for a good looking lawn. Then broadcast the new seed evenly into this rich seed bed and either gently rake it into the top of your new compost/soil mix or, even better, spread a thin layer of compost on top of the seed. No straw or other nonsense. The ideal time to spread the seed is "late summer/early fall". Specially, Nick says that the 'magic window' for sowing a new cool season lawn—that's bluegrass, rye, and/or one of the fescues—is August 15th through the end of September. This avoids the mid-summer heat that would burn the tender new grass to a crisp, while allowing plenty of time for germination in the still-warm soil and for the roots to become well established before winter slows things down. Water the newly sown seed gently every morning and every evening. The water must be applied gently; the closer to a mist you can achieve the better. The seed should germinate within a week; during this time, try and keep the soil moist; a very gentle mist all evening long would not be out of line if the air is really dry. Once it does germinate, stop the evening watering and never water in the evening again. But continue the daily morning watering until the new grass blades are an inch high. Then the roots should be deep enough for you to drop off to deep watering twice a week—mornings only—and only if rain doesn't do the job for you. Cut an inch off the top when it reaches about three and a half inches tall. Make sure your blade is super-sharp. After that, stick with a three inch high cut. (That is, wait till until the grass is around four inches tall and take an inch off—and keep that blade sharp!) Don't rake the lawn that fall; use a blower or leaf vac to get any leaves off the lawn, or just mow them into the new grass with a mulching mower set high. Then give it a feeding with weed-preventing corn gluten meal in early Spring (see this previous Question of the Week for exact timing and details), never feed it in summer, and give it a big feeding every fall. Your new lawn will look marvelous. Note: these directions—especially the timings—apply only to the cool-season grasses (bluegrass, rye and the fescues) that are recommended for areas with cold winters. Warm-season grasses—like centipede, Bermuda, zoysia and St. Augustine—are installed in the Spring, not Fall; and are ONLY fed in the summer. And what if you're a Southerner with a fescue lawn? Or a homeowner in the North who planted zoysia plugs? 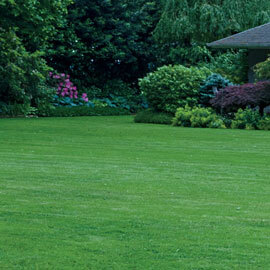 Easy—care for the lawn according to its type, not your climate or location. North or South, cool-season lawns get worked on in the Fall and get fed in Spring and Fall; warm-season grasses are established in the Spring and fed in the summer.